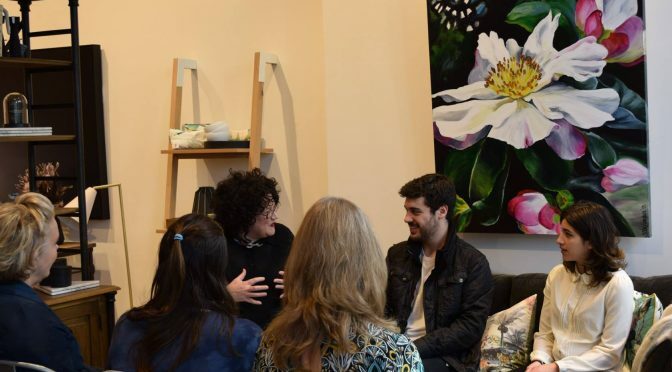 The Beautiful Room and Yarra Valley & Ranges Country Life magazine held a special event on June 16 for a private audience, called Conversations with Creatives. Creative Director Sophie Whitwell invited the six guests to individually join her on “the couch” to discuss being creatively minded. Think Oprah’s couch but classier…where Sophie interviewed her guests about their current projects, how they got there, and looking ahead. Fine artist Shani Alexander was first on the couch, sending the audience into a silent “oohing and ahhing” on her journey through the change of life and how she chose to translate that as an artist. She also talked about the necessary research, preparation and perseverance to complete her project. Kate Baker, a fine art photographer who lends her skills to the Yarra Valley & Country Life magazine, spoke about the move from corporate career to full-time artist, along with some of the hurdles. Find out more about Kate’s story in From this Place, a beautiful coffee-table book illustrating the lives of creative women in the Upper Yarra. Beth Roland and Kii Belling are writers and directors studying film, and took the guests through the delicate process of writing for the screen, and visualising a dream with the help of others. Our very own editor Mara Pattison-Sowden took to the couch next. She spoke about the pleasure of bringing together many creative people to produce the Yarra magazine. She said it was the culmination of these creatives that makes the magazine a special read. Mara also talked about how noteworthy her recent travels were. They made her realise the importance of simple human interaction. She completed cycle touring through Asia and Europe for 16 months in January, learning a variety of lessons along the way. Last but not least, Sophie asked Maree Howley to the couch. Maree is the Design Director at Beautiful Room, and spoke about growing up with the business alongside being a mother. Most importantly was the move from one of the hippest shopping areas in Canterbury. The result is its current place in Town Square, Eastland. If you haven’t been to the Beautiful Room yet, stop by and say hi. The ladies in there are lovely, and even hold creative workshops where you can get hands on! Read about the women taking Upper Yarra artists to the world.